Description: This release marks the first North American release of Rondo of Blood. Box Text: TOGETHER... AT LAST! Castlevania: Rondo of Blood. Count Dracula has returned and captured the young woman close to the famous vampire hunter, Richter Belmont. 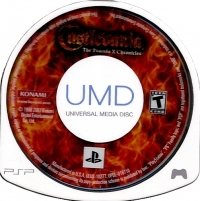 Will Richter be able to defeat Dracula and rescue his girlfriend in this new 3D adventure for PSP? Unlock the classic side scrolling adventure Rondo of Blood, which has never before been released in North America. Castlevania: Symphony of the Night. 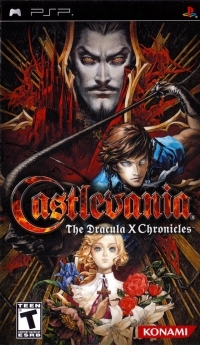 Alucard, the son of Count Dracula, and Maria Renard venture to Castlevania and encounter the evil Shaft. Who will ultimately rule Castlevania? 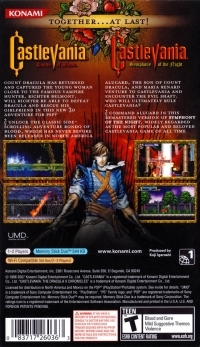 Command Alucard in this remastered version of Symphony of the Night, widely regarded as the most popular and beloved Castlevania game of all time. This is a list of VGCollect users who have Castlevania: The Dracula X Chronicles in their Collection. This is a list of VGCollect users who have Castlevania: The Dracula X Chronicles in their Sell List. This is a list of VGCollect users who have Castlevania: The Dracula X Chronicles in their Wish List.